Maybe I shouldn’t be, but I’m pretty happy with how this sweater turned out. I don’t even remember exactly what I was envisioning when I began it, but I think it finally got there, or somewhere in the general vicinity. This sweater was supposed to have been a relatively quick diversion from my #2018makenine lineup, which had been progressing at a good pace back in April, when I cast on. I allowed myself to go off-script and break my own rule about only using existing stash* because the Make Nine Challenge isn’t meant to be restrictive in any way. Besides, I reasoned, I had a long standing ambition to become proficient in stranded knitting** and although I have dabbled with small Fair Isle projects over the last several years (mainly hats), the goal all along has been to knit a full-on Fair Isle garment of some kind. I needed practice! 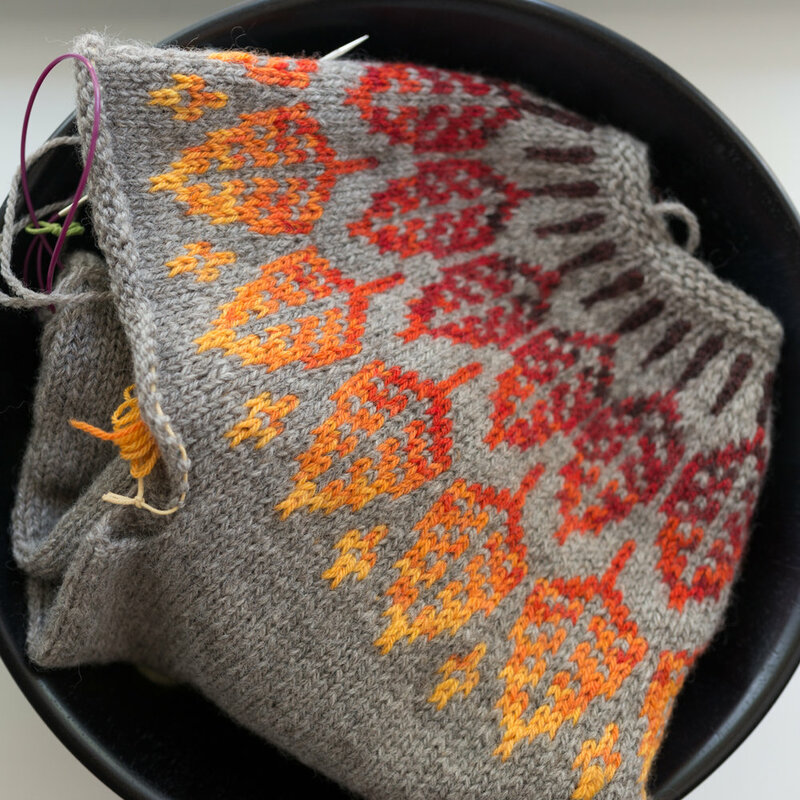 A simple stranded yoke sweater seemed like the ideal project to get my feet wet instead of trying to dive straight into Marie Wallin depths. And, let’s be perfectly honest, I got sucked into the vortex of amazing colourwork projects on IG. 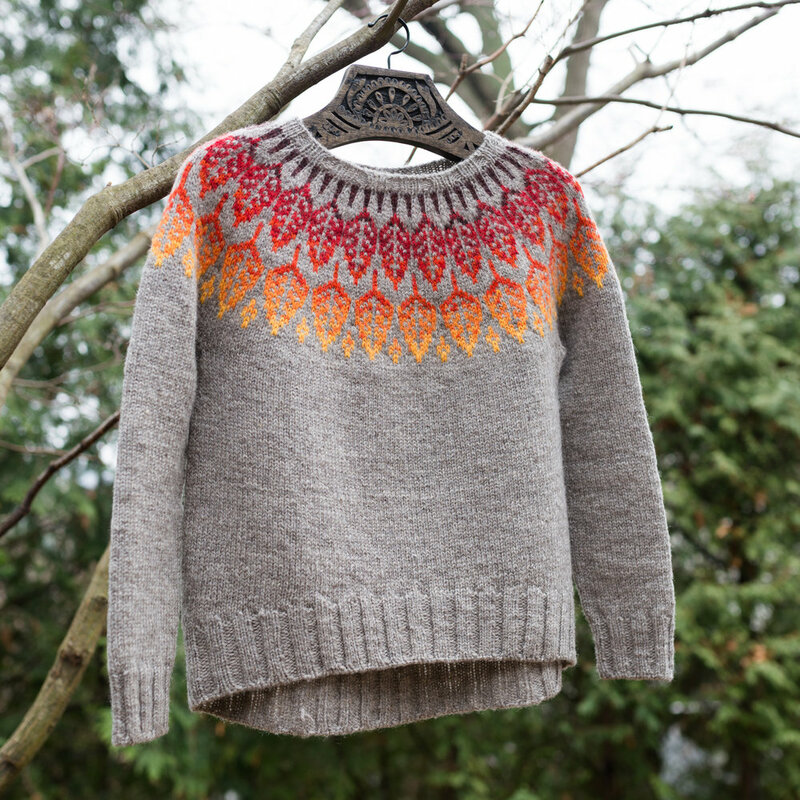 Arboreal has an easy-to-follow colourwork pattern with very few long floats but I also just enjoyed the idea of a leaf motif because I wanted this sweater to represent something personal. I wanted it to be an ode of sorts to Ontario, to home. In particular, I wanted it to be about autumn in Ontario because no matter where I travel in the world, no matter the season, no matter how impressive everywhere else is, I will love an Ontario autumn more than anything else because nothing else feels so much like home to my soul. It seems improbable, but I didn’t have any appropriate yarn for this sort of project in my oversized yarn stash (I’m a recovering superwash wool addict), so I decided that if I was going to break my yarn diet, I would do it by buying as local as possible. I’m all for supporting my local fibreshed but since I buy much less yarn than I did in the past, I don’t have a lot of opportunities to do so and this project seemed like an especially good excuse to shop local. That meant paying a visit to my go-to source for ethical and local yarn, Alpaca Avenue (which is no longer a brick & mortar shop, but Kerstin is keeping it all going in an on-line capacity). I really only needed two colours for this pattern, the main and the contrast, but I figured if I was going to knit with colour, it might as well be colourful, right? For my main, Kerstin showed me a really unique yarn that she had had processed from a batch of fleeces she obtained almost by chance from a sheep farm on St. Joseph Island. 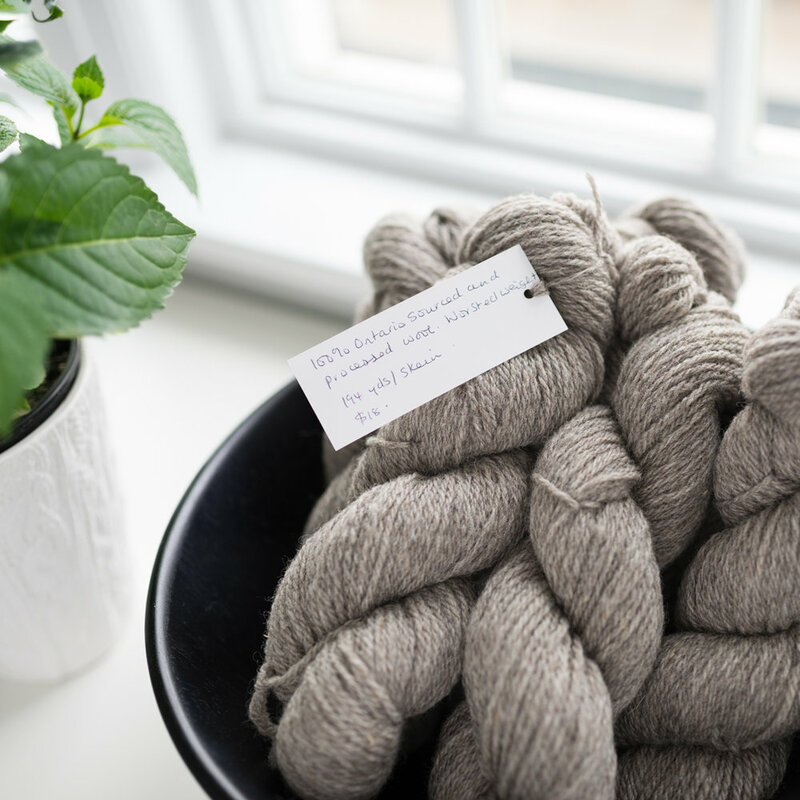 The colour is a lovely natural heathered grey (my favourite) and the wool is airy but warm. I knew that I was looking for a Canadian-dyed yarn for the contrast, preferably in some sort of gradient of fall colours but I knew that was going to be a tall order since my extensive online browsing did not find me any likely candidates in the right weight, regardless of the country of origin. Because she is just a super person, Kerstin kindly gave me some partials she had sitting around so that I could test the colour combination before committing to buying the pack. (She’s really the best! She cares as much as you do about the success of your project). Once I had blocked my swatch, I felt like it was going to be a great project. 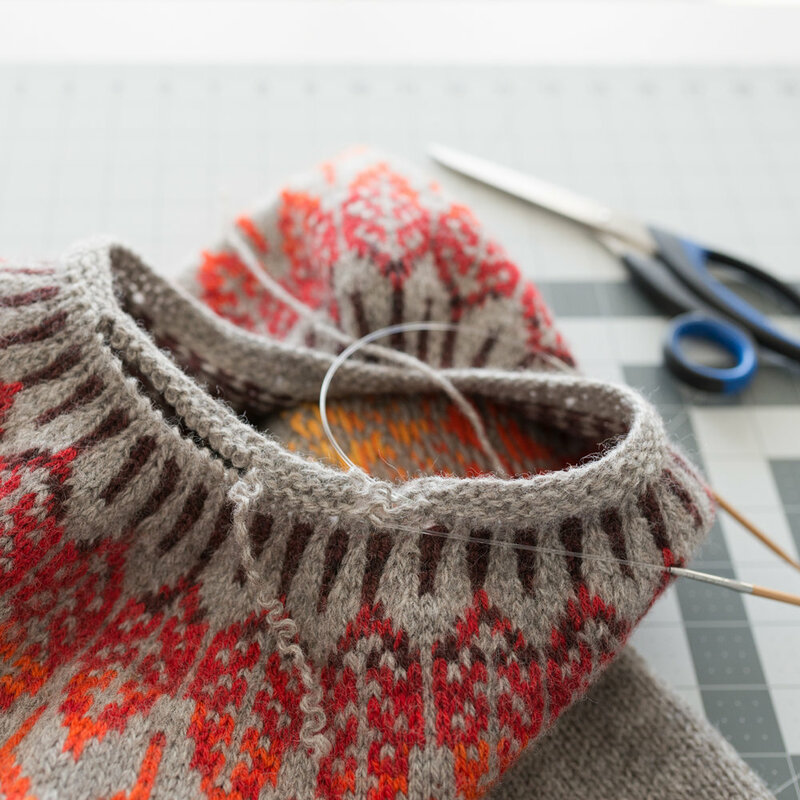 I was prepared to hit a few speed bumps on the way because I was completely new to colourwork sweaters, but even with that proviso, things did not go as I had hoped. For a long time, this sweater was touch and go. I spent the majority of the many hours I put into this sweater highly doubting if I was going to end up with something I’d be happy with. After the initial euphoria of knitting my first colourwork yoke and being quite delighted with the colour combination, I soon came to the demoralizing realization that it was probably not going to fit me very well. I had a pattern drafting instructor who always admonished us to be aware of how “flesh is distributed differently on different people even if they are the same size”. Truer words were never spoken (in a pattern drafting class, at least). Let us just say that I do not have a fleshy upper body so a partially knit circular yoke sweater on me looks a bit like an opened umbrella. I checked my stitch counts and my gauge and everything was presumably spot on. 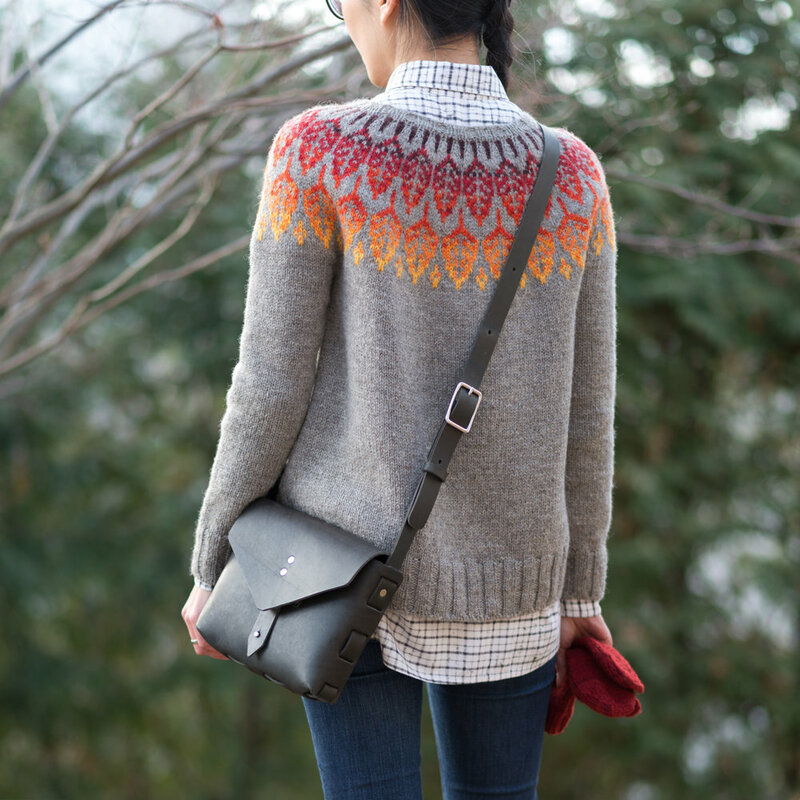 I perused the projects in Ravelry to see if anyone with a similar body type had the same issues, but no one seemed to. So I pressed on, hoping that it would all work out. It didn’t. I don’t think this is what people mean when they refer to “slow fashion”, but it does fit into my notion of slow fashion. It does no one any good if I make a sweater that won’t be worn with joy by anyone, because then it isn’t going to be worn, period. I really don’t ever want to make a thing that won’t be used or won’t last long because I was too lazy to do it right. **** By “right”, I mean that the quality of my workmanship has to be high, the fit has to be appropriate, and the aesthetic has to be pleasing (at the very least to my eye). I think this is one of the reasons I don’t manage to make a whole lot in a year. 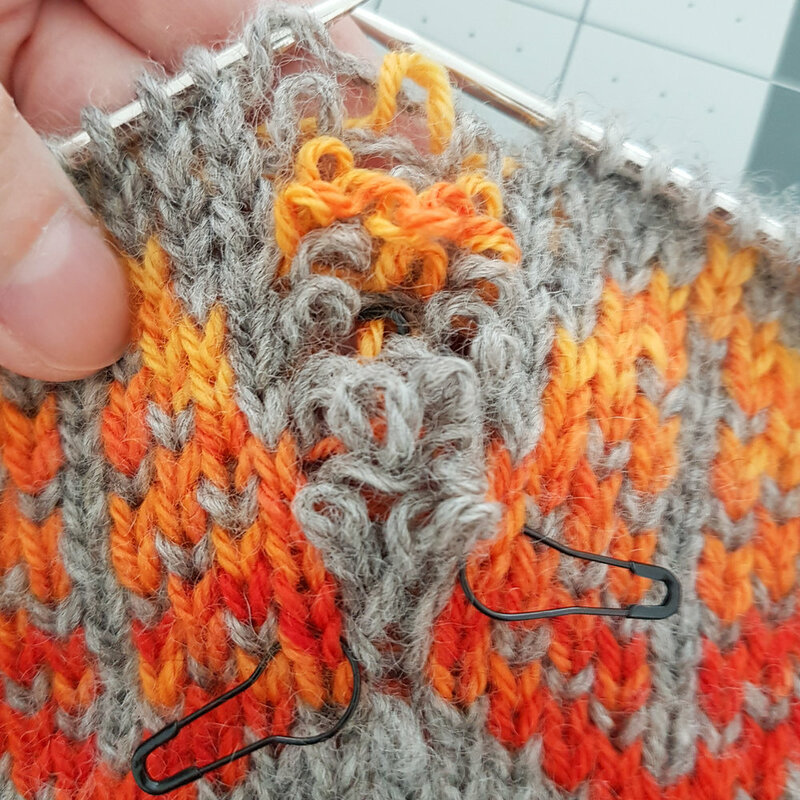 I’m not expert enough to get things right without a lot of re-working so I probably need three times the number of hours as anyone else to finish the same garment. Definitely, this sweater took me at least three times longer than I anticipated. However, I don’t know if in truth I just finally took pity on myself and called it done. I have to wonder because my partner, who is always perfectly politic about my style choices, had to choke back some laughter when he saw me wearing this. Maybe after I pack it away for the summer next year, I’ll have a better sense of how well (or not well) this all turned out since it will give me time to regain some objectivity. For now, I’m going to be toasty warm and totally secretly smug that the extra effort wasn’t utterly wasted. ***Quebec is local enough, n’est-ce pas?